This is a book which most people, even those pursuing Information Technology careers, will never read. I consider it indispensable in my constant quest for greater insight into PCs, programming, and the technology business in general. I can only pray or hope that today's and future generations will be interested enough in the history of technology to stop tweeting, txting, or killing each other in the latest fps (or whatever other fad happens to be current), and gain some insight by reading something like this book. Maybe even show a tiny bit of gratitude and humility for the hard work and invention that these early pioneers put in. 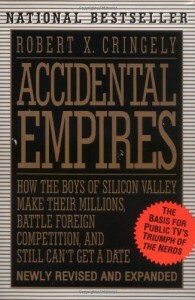 While one book can't cover everything, Robert C. Cringeley writes with the benefit of technological expertise and a clear view of the industry from the inside, and should be required reading for anyone in tech today (and increasingly, just anyone full stop). OK, perhaps I wouldn't want the Call of Duty brigade, YouTube comment writers or the tsunami of teenage twitterers to gain insight they may misuse, but all those who claim to be serious minded, or who tread a political path, should attempt to study this world-changing phenomenon that envelops all of us.